An assembled plate heat exchanger consists of a bundle of thin profiled metal plates with inlet holes for the passage of two fluids – mediums through which the heat transfer occurs. Each plate is fitted with a gasket. The plate bundle is inserted between a solid frame plate and a mobile compression plate and is compressed using compression bolts. The plates are maintained in the proper position thanks to being suspended in the frame on the top load-bearing rod and the bottom support rod. The corrugated surface of the plates produces channels, promotes turbulence and forms contact points. The bundle thus resists pressure differences on both sides. Each plate is washed by the primary medium on one side and the secondary medium on the other. Heat transfer thus occurs between the media. The connections are located either in the frame plate or in both the frame and the compression plates, depending on the application requirements. The fully counterflow design of the two media movement guarantees the maximum possible heat transfer efficiency. Alfa Laval assembled plate heat exchangers are the ideal solution for applications working with problematic media, where the heat exchanger needs to be disassembled for periodic cleaning. 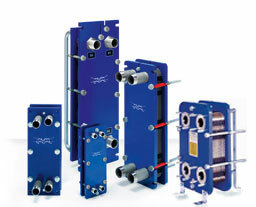 Alfa Laval assembled plate heat exchangers are key components in heating, cooling, heat recovery and steam condensation in a number of industrial applications. They are also used in central heat supply systems, heating and DHW systems, solar systems, swimming pool water warming, and applications using geothermal water. Plates can be made from almost any material that can be pressed. The most common materials are: stainless steel AISI 304, AISI 316 and titanium. The connecting piping with the joint unions is made of stainless steel and titanium, and of structural steel for some heat exchangers as well. The connecting flanges come either with a lining (rubber, stainless steel, titanium or other depending on the plate material type) or without. The long and tested service life of Alfa Laval gaskets is the result of long-term development and verification testing of sealing materials in the respective applications. The gaskets are made from NBR or EPDM rubbers, and from Viton, if necessary. The precision geometry of the gaskets is assured by one-stage casting. Our gaskets with a gabled profile ensure high sealing ability, thus reducing the risk of leakage to a minimum. Grooves in the plates and the gasket profiles align perfectly, maintaining the gasket exactly in place and preventing any risk of its bulging out of the plate. The shaped gasket grooves in plates ensure minimal contact between the gasket and the heat-carrying medium, another factor extending the service life of our gaskets. The gasket fastening methods used in Alfa Laval heat exchangers are a guarantee of a perfect result. The clip-on gaskets are very easy and quick to replace. Glued gaskets are used in applications where the heat exchangers are frequently disassembled. the exchanger design allows disassembly for inspection, maintenance, mechanical cleaning, etc.